Happy Thanksgiving! I celebrated yesterday with my family, which leaves today for relaxing and leftovers. I wanted to share the pretty table that my sister put together at my mom’s house. We had 15 for dinner so that meant my mom’s table with all the leaves in it, fully extended to fit everyone. 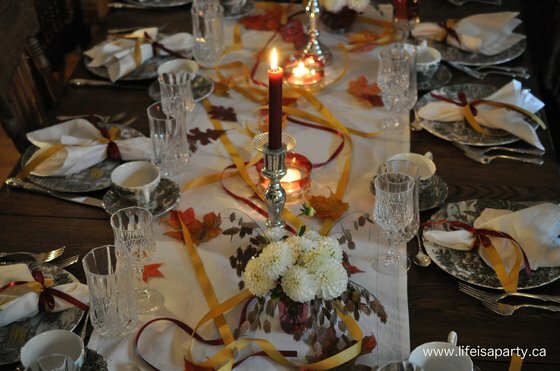 The problem of a long enough tablecloth was solved with using a simple linen runner in the centre of the table and leaving the beautiful wood showing. My sister chose to use my Mom’s hunter dishes. It was the set we grew up using, and by far my Mom’s biggest. 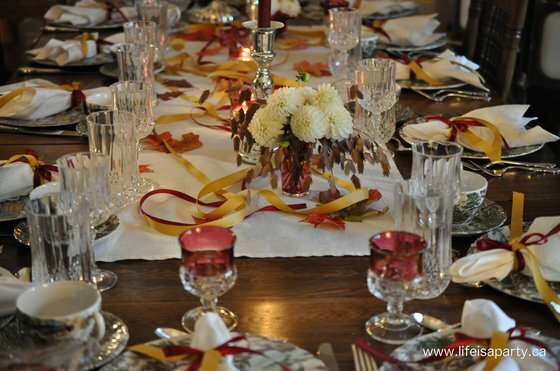 It always seems perfect for Thanksgiving too, with its green scenery and gold and cranberry accents. 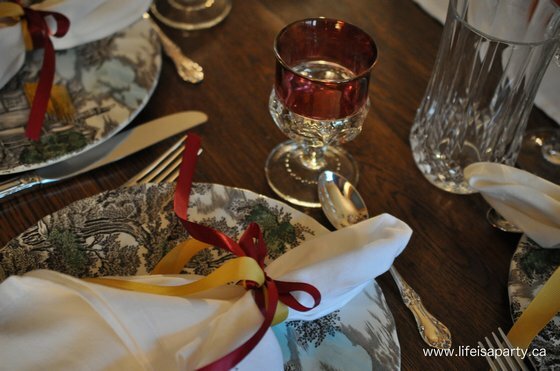 It was also the jumping off point for using gold and cranberry ribbon. 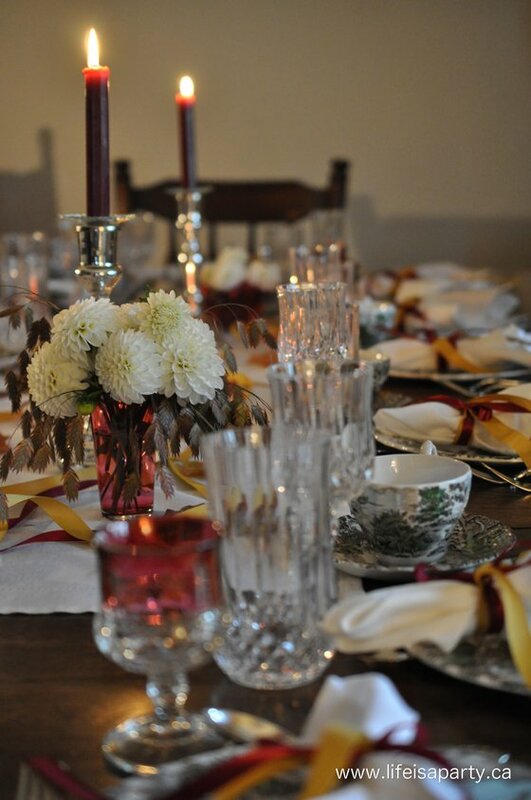 My sister Heather also used some cranberry glasses on the ends of the table, to make up 15. Heather added detail to the table by layering more of the ribbon down the centre, and pretty pressed leaves that she iron with some wax paper to add a little shine to them. It was all so pretty with the candles lit. The dinner was amazing -great food, friends, and family. 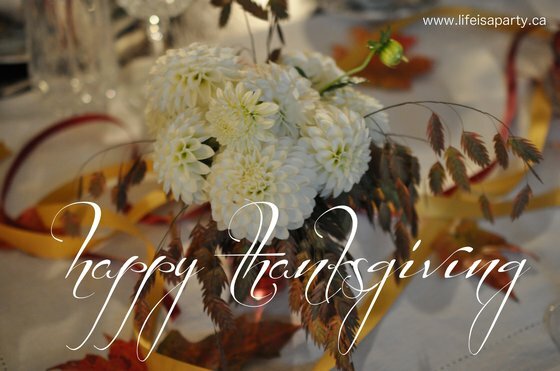 To all my Canadian peeps celebrating today, Happy Thanksgiving to you. And to my American friends, here’s some inspiration for you for American Thanksgiving. I’m especially thankful this year for the extra blessing of seeing the blog grow, slowly but surely, and for you my dear readers. 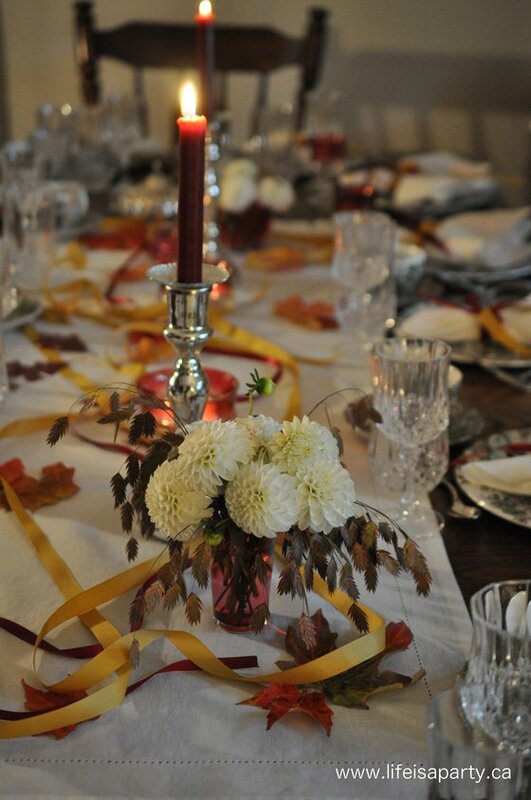 With a thanksgiving table this pretty, life really is a party. What a beautiful table! Happy Thanksgiving Dannyelle! Thanks Jo-Anna, and Happy Thanksgiving to you too! Love the black china along with the candles, well done. The crystal just fit the table. PS Your Mom’s table is gorgeous!!!! Gorgeous! Love those vintage glasses, beautiful table. So pretty! Everything looks wonderful. 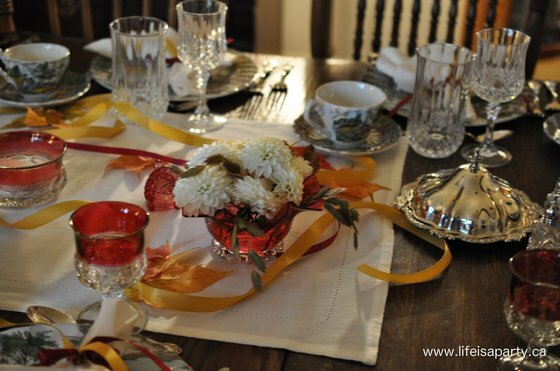 Your table is so pretty for Thanksgiving, I wish I could be there! You really did a good job, and everything just goes so well together.